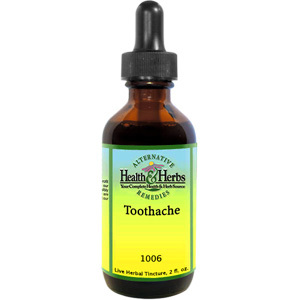 This tincture soothes the pain from toothaches. It can be applied directly to the tooth to relieve pain naturally. Apply directly to the tooth. Clove, Oat Straw, Lobelia, Cayenne, R/O water, 12% alcohol. Toothache is shipped in a discrete, unmarked package. Orders are processed immediately and usually take about 3 to 5 working days to be received. Any information received is used only for order processing and shipping purposes. Your information, such as e-mail address, will never be disclosed to a third party.